Not having seen any of the plays that preceded “Lottery Day” in the saga, I felt I had come upon preparations for a party and then the party, itself, quite accidentally without knowing any of the participants, their back story or why they interacted the way they did. 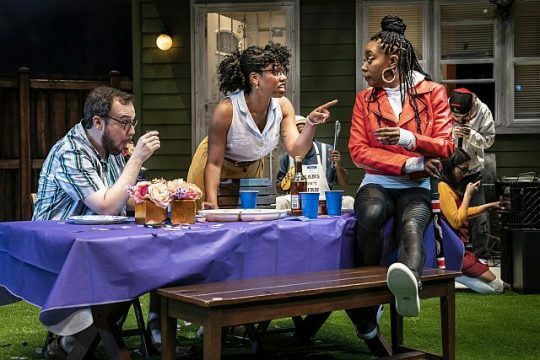 The action takes place in the backyard of the main character, Mallory, exquisitely interpreted by J. Nicole Brooks as the person who is throwing a party. You learn that she will be awarding a guest with lottery-sized winnings and that she refuses to mention the names of her husband and daughter killed by an intruder a few years back. Arnel Sancianco’s set design provides the perfect backyard of Mallory’s well-cared-for, traditional neighborhood house and the new, modern one next door. She resents the neighborhood’s gentrification, her next-door neighbor’s “Lincoln Park” contemporary style house, that her neighbor is actively changing the area and that neighbor’s lifestyle which doesn’t appreciate the parties held in Mallory’s backyard. Directed by Lili-Anne Brown the entire cast is excellent. My problem was that I couldn’t catch a lot of the dialogue and I would have liked to have gotten to known the characters better. 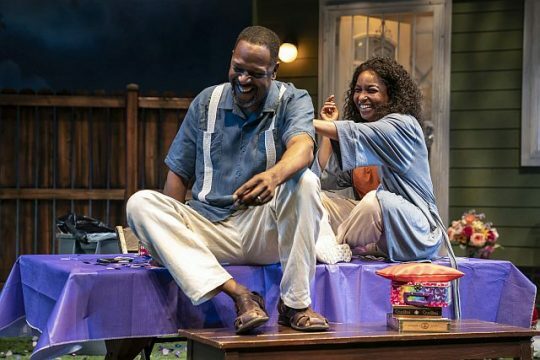 DETAILS: “Lottery Day” is at Goodman Theatre, 170 N. Dearborn St., Chicago, through April 28, 2019. Running time: 2 hours, 5 minutes, with 1 intermission. For tickets and more information call (312) 443-3800 and visit Goodman/tickets.